Ava means “little bird” in Latin. We thought it was a pretty name and a beautiful symbol for our little girl. (OK, so Joia was the thoughtful one who picked the name out… but I agreed with her.) Several months after naming her, I was rereading Story of A Soul: The Autobiography of St. Therese of Lisieux, and was struck by how beautiful and how appropriate to our situation the passages below were. Since that time, St. Therese has become a very special patron and intercessor for our own “little bird”, making her prayers very clear to our family (but that’s another story). [Just as we pray for one another, those Saints who have gone before us still intercede on our behalf. We don’t worship them or pray to them, but we do know they are powerful prayer partners. For an understanding of the intercession of Saints, visit www.catholic-forum.com/saints/patron03.htm.] Enjoy these excerpts and please continue to pray for Ava. 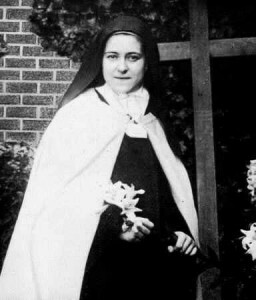 St. Therese of Lisieux, pray for us. I look upon myself as a weak little bird, with only a light down as covering. I am not an eagle, but I have an eagle’s EYES AND HEART. In spite of my extreme littleness I still dare to gaze upon the Divine Sun, the Sun of Love, and my heart feels within it all the aspirations of an Eagle. The little bird wills to fly toward the bright Sun that attracts its eye, imitating its brothers, the eagles, whom it sees climbing toward the Divine Furnace of the Holy Trinity. But alas! the only thing it can do is raise its little wings; to fly is not within its little power! Dear St. Theresa please pray for my dgahuter Dawn, who has RSDS, this disease has affected all of her body with the exception of her left arm and hand. She is in extreme pain 24 /7; 365 days per year. On a good day her pain level is a 7, that’s a good day. She suffers so many side effects from this dreaded disease, a mere hug is so painful that it makes her cry, her daily showers cause her pain to heighten, clothing sock and shoes cause added pain, she suffers with migraines two to three per week, insomnia – she has not had a restful full night sleep in so long, chronic fatigue, damage to her bones, tissues, mussels etc., the side effects are just too numerous to list. As if RSDS were not enough for Dawn to deal with she has also been diagnosed with Fibromyalgia late on-set of Lyme Disease and Chronic Fatigue. The treatment for Lyme Disease began yesterday, a pick-line was inserted, her daily medication is making her extremely sick, please let her body accept this medication without the side-effects she is experiencing.She will also need a third surgery to remove the spinal cord stimulator implanted at the base of her skull because it is not working as hoped to relief she pain. Instead it causes her so much additional pain at the base of her skull giving her additional sever headaches.St. Theresa I also ask you to please pray that Dawn wins her appeal against RSI without it going into litigation; she needs her long term disability benefits reinstated immediately. RSI her insurance company stopped paying Dawn her monthly benefits December 2010. We received a 30 day extension from RSI in order to provide new medical finding that her doctors found in the last few months. I’m pleading Dawn wins this appeal now because she is in such pain and so depressed I fear she can no longer handle one more disappointment and does not have the energy to fight for her benefits. She has no money and no place to go, making her depression deepen, she is sad, lonely, and frighten of what is to come of her.St. Theresa please ask our Lord Jesus for a miracle for Dawn please hear and answer my cries for help for my dgahuter, there is only the two of us.I know I’m requesting a lot, however, Dawn just cannot catch a break; things just seem to be going from bad to worse; SHE TRULY NEEDS A MIRCLE! She turned 40 on August 21 and I pray her life will do a complete turnaround and will receive a rainbow of miracles and blessing as she is a wonderful person and deserves to have a healthy, happy and prosperous life.Thank You Love With All My Heart! O dear little Saint, now that you see the crucified Jesus in heaven, still bearing the wounds caused by sin, you know still more clearly than you did upon earth the value of souls, and the priceless worth of that Precious Blood which He shed to save them. As I am one of those children for whom Christ died, obtain for me all the graces I need in order to profit by that Precious Blood. Use your great power with our divine Lord and pray for me.